About 1 in 4 people will experience some mental health problems in their lifetime. The garden, which focuses on the message that there is hope and recovery for those who experience mental illness, is designed and built by participants from a number of Community Mental Health projects throughout County Wicklow: New Dawn, Bray; Killmullen Centre, Newcastle Hospital and The Tunnel Project, Arklow. The concept of the garden is to provide a visualisation of the different pathways people take when experiencing mental illness or stress in their lives. These pathways can lead into addiction, depression, isolation and suicide. However the pathways in the Recovery garden are depicted as a road which can lead to recovery. It is not straight, nor is it easy but it does provide a sense of hope necessary for individuals and families to keep going even in the face of crisis or trauma. 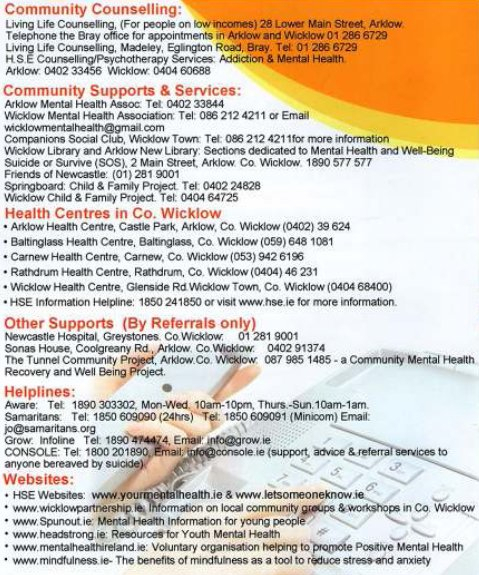 It is a community initiative, supported by the mental health services in Bray, Wicklow and Arklow and initiated to support people who experience chronic and enduring mental illness. For most people in their situation it is not easy to face each day however through gardening they have found the great strength to believe that the road to recovery is open to them and they can move on with their lives. Through this project people with severe enduring mental illness are no longer viewed as hopeless, or merely as passive recipients, but rather as citizens with the capacity for full community participation, recovery and integration. Higgins & McBennett (2007) refer to the petals of recovery to illustrate that movement in the personal journey towards recovery is not a linear process. The separate petals of the symbolic flower identify the essential elements that aid ‘the process of getting better’ and can lead to positive outcomes for people who use mental health services. In designing this recovery garden, the participants worked with a horticulturalist specialist who had a great understanding of mental health difficulties and the importance of raising public awareness and communicating the message that ‘recovery is possible’.It has also been a learning experience for everyone involved. They have developed new skills and expertise while at the same time promoting a very important message and appreciation of wellness and positive mental health. “A Vision for Change”, Ireland’s mental health policy, stresses the importance of placing the participants’ recovery journey at the centre of service delivery and this garden provides a practical example of how this message can be delivered in an optimistic and positive manner. This garden is a practical and very positive example of what we are working to achieve in the implementation of Vision for Change, Ireland’s mental health policy. Finding ways to support people on their journey to recovery can be difficult as each journey is different. Gardening has helped to give a structure to people experiencing chronic mental illness and stress. It combines purpose and meaning and an understanding that life is constantly changing. With this change comes ‘hope’ that their lives can move on. Hope gives them a destination and make recovery possible. A significant number of plants used in the garden were grown by the participants in a greenhouse in Sonas in Arklow and in the Kilmullen Centre, Newcastle Hospital. The mix of flowers and shrubs, and colour are significant is providing the visual transition in recovery - herbaceous perennials and summer bedding mirror joy, recovery and wellness.